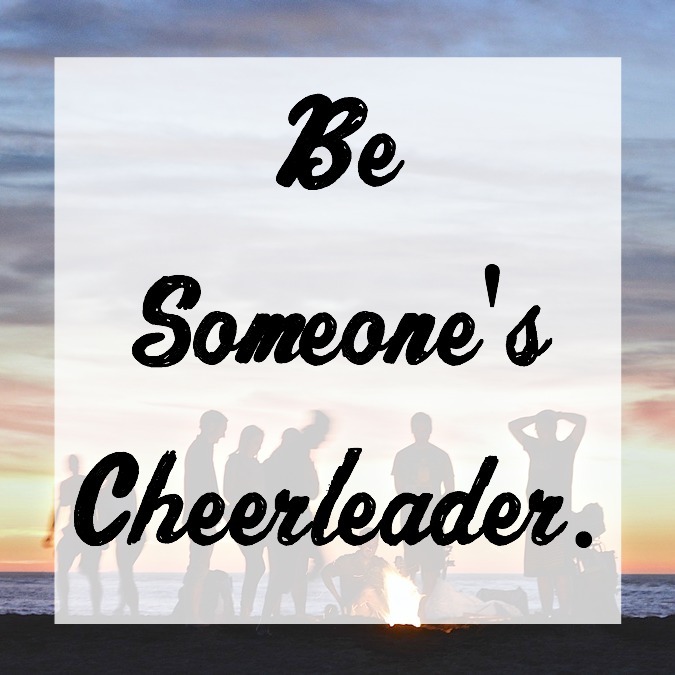 Be Someone's Cheerleader. | The girl who loved to write about life. There's not much that feels better than knowing you have someone on your team. Better yet, knowing that you have someone on your team no matter what. That's one of my favorite things about marriage-knowing that no matter what happens and no matter what I do or if I fail or anything else, Chris is going to be on my team. If you had the privilege of growing up in a good family, or you have a group of friends that have become your family, you know what I mean. They're your team, and they aren't going to turn on you when you make a mistake. There's something about that knowledge that gives you so much confidence. It's a beautiful gift. And it's a gift I think we should give to others whenever possible. Sure, you can't give everyone you meet the gift of having a permanent teammate who's always going to be on their side (although, if it's someone in your life for the long-haul, you definitely should), but you can give them the gift of being encouraging. Of being their cheerleader. Your friends, your family, your acquaintances...I doubt there's anyone in your life who wouldn't benefit from being told that they can do it, that you do believe in them, that you think they're amazing. Because really, doesn't it feel great when someone does that for you? So be someone's cheerleader today. This week. This month. Choose to tell someone how great they are, how successful they're going to be, how much you admire their efforts. Choose to silence the negative and yell out the positive. It truly can make the biggest difference. I feel like I have been so lucky to be surrounded by amazing family, and to have married into an amazing family! Also, most days I am unhappy with my job--but it does give me the opportunity to be a cheerleader for so many amazing teens, and that is the best and most rewarding part! Yes to this!! Especially with all that's been going on with me lately, it's been huge to have people permanently on my team! YAY for baby!! I love this. my husband doesn't always have the most emotional family (i.e. they don't get visibly excited over things that are big), and lots of great things are happening for him in his career, so I've started to recognize that he needs to be his cheerleader even if he doesn't realize it right away. Love this! My family and my husbands family are so supportive, we are so lucky! Amen, amen! It's about lifting each other UP! Nothing better in the world. I don't think anything can make you feel more loved than knowing you have someone on your side. This is so true! Everyone needs a cheerleader and one way we can bless the people and the world around us is by encouraging them. Great reminder! This is so, so true! Having someone on your side is game-changing. And it is important to build others up, too! My goal is to be more positive and supportive, so this is the encouragement I need. And yay for baby! This is so true! It really costs nothing to be kind and support others. Hope life is going great with your new baby! Such a lovely post! And also ever so true. Loads of people are there for me day and night, as I whinge about something going on - yet I know I could be there more for other folks. Definitely need to become somebody's cheerleader! This is a such a great idea. It's so true that those types of positive vibes have such an impact on your day when you receive them. I'm not always the world's most positive person, so I think consciously building someone up is a great way to start overcoming that. I love this! As a counselor, I am way too aware that many people do not have a cheerleader in their life. A great reminder. This post is amazing! Sometimes, all someone needs is a little motivation, a little push!